Michael Champigny, 42, badly need a liver but had to wait weeks even though he had landed in the intensive care unit with a serious abdominal infection. Transplant surgeon Dr. Adel Bozorgzadeh wants to heal patients, not watch them die. He had already lost four patients since summer — all on the wait list for a liver. Another one, 42-year-old Michael Champigny, had survived a life-threatening infection before Thanksgiving and urgently needed a new liver too. But Bozorgzadeh can never predict when — or even if — that will happen. What he does know is that his patients at UMass Memorial Medical Center in Worcester could get transplants faster if they were allowed to use donor livers from Georgia and South Carolina, where the supply is greater. Bozorgzadeh passionately supports a proposal by the organization that oversees US transplant policy to dramatically alter how donor livers are distributed. The idea is to fly livers from states in the South, Midwest, and Northwest that have more donors to places like Massachusetts, New York, Minnesota, and parts of California, which have higher demand. But since it was released for public comment in August, the plan has quickly become one of the most divisive in transplant history. More than 1,000 comments, many in outraged opposition, have poured in to a government website. Many argued that rural patients have inferior access to health care in the first place, and that this will exacerbate the problem. “Keep Georgia livers in Georgia!’’ wrote several opponents. One man from the Midwest accused transplant centers in the Northeast and elsewhere of “taking the easy way out by trying to poach our organs’’ rather than increase donations in their own cities. The debate has strained longstanding relationships among medical colleagues and pitted patients against one another. Surgeons in the Southeast and Midwest have suggested that doctors in the Northeast exaggerate how sick their patients are to win better access to organs, which go to the sickest patients first. Meanwhile, physicians in the larger cities say that their colleagues at the smaller transplant centers are more worried about their program’s bottom line than a fair system for patients. Dr. Kenneth Chavin, a South Carolina transplant surgeon, noted in online comments that the debate echoes the tone of the recent national election. Given the opposition, the United Network for Organ Sharing committee that crafted the proposal has gone back to the drawing board on a plan that it had already researched and vetted with surgeons for two years. But many surgeons are pessimistic that they can reach a consensus, given the fact that previous attempts to fix geographical disparities in liver transplants have erupted in disagreement too. The benefits of liver transplants are indisputable — patients who are expected to die within weeks can instead live decades. The number of deceased liver donors in the US has risen steadily in recent years; about 6,800 transplants were performed in 2015, a 13 percent increase over 2010. But that still hasn’t been enough to keep up with demand, creating a waiting list that stood at 14,520 patients earlier this month. Currently, livers from people who have died generally go to patients in the service area of the local organ bank and then to the broader geographical region — there are 11 in total — with the sickest patients getting top priority. Livers rarely leave a region — unless they are poorer quality and not wanted by patients there. Doctors give patients a “medical urgency score,” from 6 to 40; the higher the number, the more likely the patient will die within three months — and the higher their ranking for a transplant. The wide national variation in supply and demand has led to inequities in how long patients must wait for a liver and how sick they must be to get one — if they get one at all. In Georgia and South Carolina, patients have an urgency score of 22 on average when they receive a liver, according to the organ sharing network. In Massachusetts, they are far sicker, at 28 — though surgeons in rural areas argue the number is inflated because of the wider use of a practice in the Northeast that gives patients extra points for certain medical conditions. The proposal released in August seeks to combine nearly the entire East Coast from Georgia to Maine into a single region. Livers from organ banks in the Southeast would be offered to the sickest patients in the Northeast before they go to moderately ill patients in the Southeast — and vice versa. It’s a bold change that could benefit patients like Champigny. Suffering from fatigue and jaundice, the former construction worker went to the emergency room two years ago. Tests showed his liver was badly damaged; Champigny said he took a lot of Tylenol to treat chronic sciatica and that he sometimes drank too much. Last summer, he dropped 60 pounds from his 200-pound frame and grew too exhausted to work, climb stairs, or even shave. He was devastated when Bozorgzadeh told him a new liver was the only option. “I had no idea it was that severe,’’ he said. When he was cleared for the wait list at UMass Memorial a year ago, his urgency score was below 20. Then, before this Thanksgiving, he landed in the intensive care unit with a serious abdominal infection. His score shot up to 32. That still wasn’t high enough to get a liver in New England that week, where Bozorgzadeh said there were about 20 patients ahead of him. But Champigny rallied. 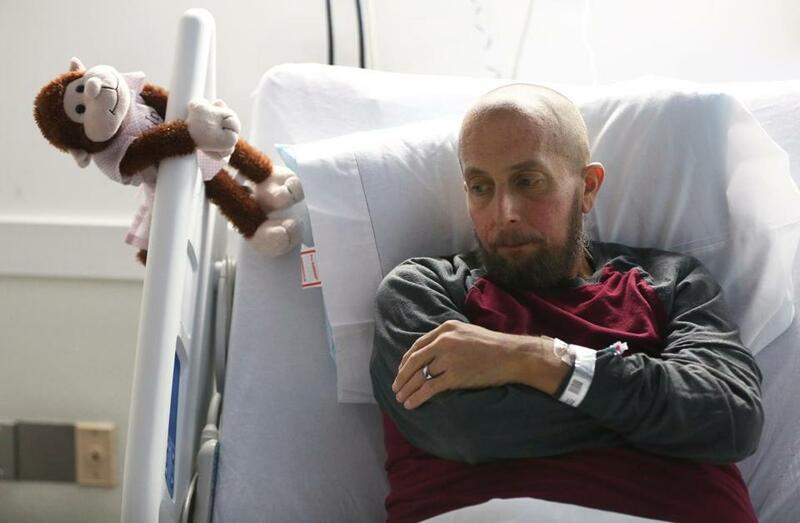 Days before the holiday, he perused food magazines in his hospital bed, planning his family’s Thanksgiving menu and hoping to spend it at home with his wife and 9-year-old son. If he lived in Georgia or South Carolina, his surgeon believes he would have had his transplant far sooner. Finally, last week, Champigny got his transplant. Brenda Mitchell was waiting for a new liver too — in Atlanta. She said that while she is not urgently ill, she is “slowly dying’’ from liver disease. Mitchell echoed a common criticism of the recent proposal — that because organs would travel further in some cases, their quality would not be as good, or at least that would be the presumption by surgeons. “Deserving recipients who are 20 minutes from the hospital, and gravely ill, will have to die so a person 1,500 miles away can receive the degraded organ hours later. How is this fair?’’ she wrote to the organ sharing network. Dr. Prabhakar Baliga, chairman of surgery at the Medical University of South Carolina, said families frequently donate their deceased relatives’ organs specifically to help neighbors. He worries that donations in his region will plummet if the system is changed. One reason there is a greater supply of donated livers in Southeastern states relative to demand is that residents die at younger ages from strokes, car accidents, and gunshot wounds, surgeons said. Residents also generally have less access to medical care than those in the Northeast, which can also lead to lower demand if people with liver disease never make it onto a transplant wait list. Sending livers up north is “leveraging an area of greater need to one of greater privilege,’’ said Dr. Raymond Lynch, a transplant surgeon at Emory University School of Medicine in Atlanta. Bozorgzadeh doesn’t see it that way. He is galled by a video on the University of Kansas Hospital website, in which Dr. Timothy Schmitt, chief of transplantation, encourages patients who need liver transplants to come to his center, which has “some of the shortest waiting times in the country.’’ This, too, could create economic disparities, the UMass Memorial surgeon said. Patients who have money, like the late Apple co-founder Steve Jobs, can travel for extended periods. Jobs left his home in Northern California in 2009 to get a liver transplant in Tennessee, where the supply-to-demand ratio was more favorable. Schmitt said the University of Kansas Hospital video is several years old, and the wait there is no longer short enough to attract much national business. Meanwhile, Dr. Ryutaro Hirose, a San Francisco transplant surgeon and chairman of the committee that proposed the recent plan, said his group will try to redraw the lines again and propose a new plan by next August. There is no choice, he said, given that the federal government ordered in 2000 that the United Network for Organ Sharing ensure that transplants are not medically futile, that they are based on sound medical judgment, and that access does not vary by geography. The last “is the only thing we have not made any progress on over the last 16 years,’’ he said.